CATCH & RELEASE is located on 4 SECLUDED, CREEKSIDE, WOODED acres in the Shagbark gated community. We are one minute from our clubhouse, swimming pool and tennis court. This cabin has WIRELESS HIGH-SPEED INTERNET, 2 gas fireplaces, 2 KING bedrooms each with TV & DVD and separate receivers, 1 QUEEN bedroom with private bath, and updated bathrooms. All linens are provided and the kitchen is fully equipped for cooking family meals. The loft has a POOL TABLE, which has views of the flat screen TV in the living room and the pond. There is a good selection of board games; Checkers, Chess, Apples to Apples, and Backgammon for those rainy days or fun nights. We have a 40 DVD movie collection for those days our guests want to just hang out at Catch & Release. We will be adding to it each season. We added a whole house Generac Generator for those storms that take down trees. You will always have power! The dramatic 30’ vaulted rock fireplace wall has a 42' FLAT SCREEN TV with SURROUND SOUND and DVD. The new THEATER/FAMILY/GAME room has a 48” FLAT SCREEN TV and DVD, bamboo hardwood floors, Foosball table, glass walls looking into the fishing pond and the backyard creek, and all leather furniture. The 5 ton zoned Air Conditioning and Heating system is energy efficient and meets government specifications for GREEN buildings. Our new bathroom products are from Concept Amenities, an Australian soap company whose soaps are in 5-star European hotels. The bath gel, bar soap, shampoo, conditioner and body lotion are biodegradable and environmentally sensitive. We love our environment and know that you do too. This is why you vacation in the Smoky Mountains. The backyard creek runs under the house into a large FISHING POND in the front yard, which has Goldfish, Catfish, and Brim. You can fish from the front deck in the stocked pond. Please bring your fishing poles. We request that you CATCH & RELEASE ONLY. The pond fountain automatically turns on to enjoy your morning coffee and turns off in the evening. It off in the winter months. The CREEKSIDE HOT TUB is in the moss-covered backyard and under a COVERED TRELLIS in case of rain. The Hot Tub is emptied and refilled prior to each guest arrival in accordance with the Tennessee Department of Health Regulations. This is the most peaceful vacation home you will ever visit. It is tucked amongst the trees and early in the morning, WILD TURKEYS come to drink at the edge of the pond and the occasional bear drifts by to take a bath with her cubs. There are new bamboo floors, slate counter tops, appliances, area carpets, washer-dryer, and amazing landscaping in the front yard with a dry creek bed in stone, large boulders, and a RESIDENT TURTLE. The RACCOONS love Oreo cookies. THIS IS A GREAT PLACE FOR FAMILIES. KIDS LOVE IT!!! WE ARE 10 MINUTES FROM THE CENTER OF PIGEON FORGE, 20 MINUTES FROM DOLLYWOOD, AND 25 MINUTES FROM GATLINBURG! LESLIE'S WEEK at Catch & Release is proud to announce we are a 501 (c)(3) tax-exempt Nonprofit benefiting Stage 4 Metastatic Breast Cancer mothers and their families. Our Stage 4 breast cancer women and their families make Memories that Outlast Cancer at Catch & Release! Please go to our website to see what we are doing, www.lesliesweek.org. Sandra Gunn, the owner of Catch & Release, was selected from 6,200 nominees by L'Oreal Paris Cosmetics to be one of their ten 2016 WOMEN OF WORTH Honorees. Her work for Stage 4 Breast Cancer women & their families received National recognition on November 16, 2016, at the L'Oreal Paris Gala in New York City. Sandra is a Breast Cancer survivor and the Founder of LESLIE'S WEEK, which was awarded the 2017 "Community Breast Cancer Nonprofit of the Year" by Breast Cancer Wellness Magazine. Catch & Release is open to Stage 4 Breast Cancer women all year and LESLIE'S WEEK reserves a week every August at the Dollywood DreamMore Resort for families whose mother is suffering from incurable breast cancer. Our 2017 vacations at the Dollywood DreamMore Resort hosted 20 families! We will host 40 families in 2018. Stage 4 Breast Cancer is a family disease, affecting each member and every aspect of their life; including relationships, finances, career & school performance, and their shared quality time. LESLIE'S WEEK is a time of Fun & Happiness! The private Shagbark Community HOA resolved on May 16, 2014, to become the Home Base for LESLIE’S WEEK. On October 24, 2014, Mayor Larry Waters of Sevier County and Mayor Brian Atchley of Sevierville Proclaimed the second week in every August as LESLIE'S WEEK throughout Sevier County. See their official PROCLAMATIONS on our website www.lesliesweek.org. Stage 4 Breast Cancer families need a safe haven from the pressures of fighting this deadly disease. They need the opportunity to build MEMORIES that OUTLAST CANCER. LESLIE’S WEEK Mission is to give these mothers a reason to rejoice about TODAY and TOMORROW by providing Fun & Happiness for families TODAY and offering each LESLIE’S WEEK child participant educational assistance in the name of their mother toward the degree or vocation of their choice to help create a better TOMORROW. LESLIE'S WEEK Stage 4 Breast Cancer candidate mothers and their families are chosen regardless of religion, race, ethnicity, and age. I am an interior designer and writer with published books. Catch & Release is a work in progress for me as I continue to change the interiors and update the amenities. Because I am in the design industry I continually buy new products for Catch & Release. It is a place of serenity and peace surrounded by nature, small critters and the changing seasons. I am also a breast cancer survivor and the founder of LESLIE'S WEEK, A Stage 4 Metastatic Breast Cancer Nonprofit. Our Nonprofit sends Stage 4 Breast Cancer women and their families on "Vacations Away from Cancer" where they make Memories that Outlast Cancer. Catch & Release is used throughout the year to host Stage 4 Breast Cancer families. For many of our families, this is the last vacation they will have with their children and husbands. Catch & Release is within an 8 hour or less driving distance of 80% of the US population. It is easy to get to via the interstate road systems. My cottage is located in a gated community whose 24 hour manned security center is there to log you in, provide directions, answer questions and provide assistance to you and your family. Even though it is secluded in the mountains, it is within 10 minutes of the center of all the activity in the Smoky Mountains. There is Dollywood, 4 golf courses, fishing, winter skiing in Gatlinburg, outlet shopping, a variety of kid entertainment and rides, and many affordable restaurants. There is no place like it and it is a wonderful place to have a family vacation. When you drive into Pigeon Forge the Welcome Center has free coupons to offer each traveler so they may take advantage of the many discounts offered to families. Catch & Release is built over a creek which feeds into a fishing pond with a fountain in the front yard pond and within a decorative landscape. The cottage sits on 4 acres and is surrounded by a forest, whose small critters come by to inspect the guests from time to time. The mornings are wonderful when the fountain comes on. You sit and drink your coffee and listen to the soft sound of the splashing water. We added a whole house Generac Generator for those storms that take down trees. If you are looking for interior comfort, an immaculate property, serenity, comfort, and activity beyond your dreams - Catch & Release is the place to find it. We upgrade the interiors every year so it will be different every time you return! Come on over! Queen bedroom on first level has a private bathroom. 5 minutes from the center of Pigeon Forge, 20 minutes from Dollywood depending on traffic, 25 minutes from Gatlinburg. The Great Smoky Mountains is the most visited national park in the USA. Fishing, tubing, hiking, picnicking, hunting, golfing, direct shopping malls, Dollywood, music theaters, within 15 minutes. 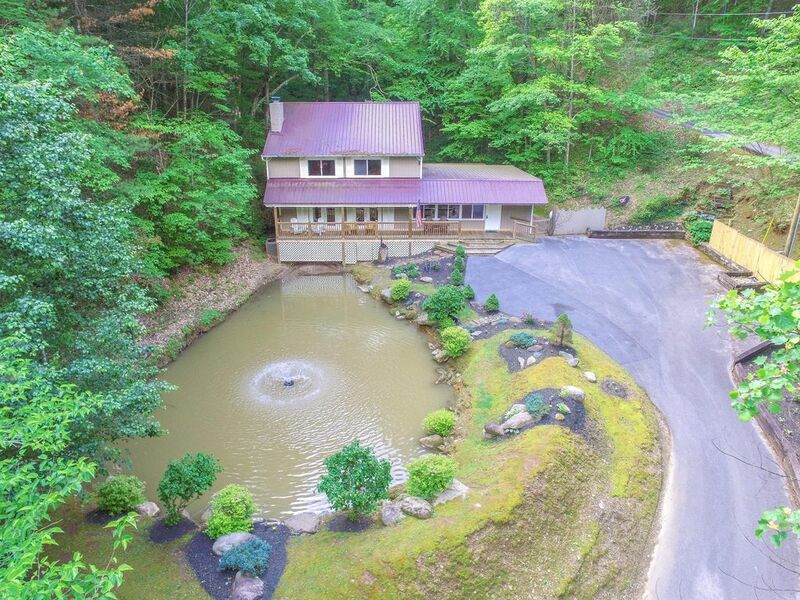 Private 3.5 acre, secluded property in the woods and a gated mountain community called Shagbark. We are located 10 minutes from the center of Pigeon Forge and 20 minutes from Gatlinburg & Smoky Mts. There is a creek that runs under the house and a large fishing pond with a fountain in the front yard of the house. There is a fishing deck over the pond. There is a 3 ton air conditioning system in the main house and a 2 ton system in the family/game/theater room. Brand new and Green according to Government standards. Bed linens for 6, pillows, bath and kitchen towels. Extra quilts and pillows in the closets. The living room has a new gas fireplace with and automatic wireless timer. Parking for up to 6 cars or more in the spacious driveway and parking area. Enjoy FREE wireless Internet from outside sitting on the porch or in the comfort of the Catch & Release cabin. Flat screen TV surround sound, gas fireplace, library and other features. Living room seats up to 8. New with Complimentary First Morning Coffee with amenities provided. Spices and salt and pepper included. All appliances included as in modern kitchen and fully equipped for all meal preparation. Family Room Dining seats 6 and theater room seats 4 - total seating is 10 for holidays. (4) A 42' flat screen HD/LCD TV above the fireplace in the living room with surround sound. A 48' flat screen HD/LCD TV in the family/game/theater room. Both king bedrooms have TV's. Surround sound stereo in Living room. A small library is included in the living room. A pool table in the loft, foosball table, checker and chess table, and board games in the family room. All TV's have digital music channels. The loft has a pool table with all accessories. We have a collection of 45 DVD Movies for those rainy days. Fish from the living room balcony! There is a private covered patio in the back yard and a deck above the fishing pond in the front yard. Our community clubhouse has a private pool and tennis court and is only 2 minutes from Catch & Release. There is a private community clubhouse, swimming pool, and tennis courts. Our hot tub is located on the creek under a covered wood trellis in a moss-covered backyard that faces the woods. Had a wonderful stay in a very clean cabin. Host was awesome, along with Wayne, who came out and fixed the trash container after Mama bear had knocked it over. Got to see the bear take a swim too. Entire group had a wonderful stay. Thank you for sharing your cabin. Great location for seeing wild life. Excellent stay, and the owner was very responsive. Lots of room to spread out to play cards or play games, house was immaculate. Wonderful cabin and great experience working with owner. She was very helpful and accommodating! The place was clean, well stocked, and very secluded. It was a little dicey getting there at night (with heavy rain and fog) but we made it just fine. Highly recommend. My housekeeper said for GUYS you all were thoughtful and courteous. Thank you for being helpful for our housekeeping/maintenance staff. We appreciate you! Come back and see us again. Our family stayed for four nights over the Thanksgiving holiday and we loved it. It is very private, quiet, and very clean. We didn't get many bites from the fish but it was just nice to sit on the front porch and relax. The owner was very responsive and answered our questions quickly. The only thing is if you are looking for a view of the mountains this is not the spot. Other than that I give this place two thumbs up. We loved having you and your family for this wonderful holiday. So happy you appreciated the cleanliness and outdoor ambiance. Great cabin in a wonderful location! Owner very responsive to any questions or concerns. Top notch! Will definitely return. It was clean and cozy. Plenty of room for a crowd and very convenient to town. Music Theaters and Dinner Shows, 20 minutes from Dollywood, Arts and Crafts Community with Shops, 25 minutes from Gatlinburg and its Ober Gatlinburg Ski Resort, 20 minutes from Picnicking in the Great Smoky National Park, 10 minutes from Factory Direct Shopping Malls, University of Tennessee, Cherokee Indian Reservation, 45 minutes from Casino 30 miles to North Carolina. Pigeon Forge is a family oriented vacation resort with many activities for the Kids, shopping for the Mom, and great golf (4 courses) for the Dad! The Smoky Mountains are the most visited National Park in the U.S. bringing in more than 13 million visitors each year. Tennessee people are the friendliest people in the USA and they are what most guests say was their best experience - Tennessee hospitality and polite welcome! Come have the best vacation you will ever experience! Google maps and the Welcome Package are provided 30 days prior to guest arrival. We are in a gated community and car Security Passes are required for entrance. Your car information on your completed Reservation Form is entered into the security database and your passes are ready for you when you arrive at the gate. Check in is 3:00 PM and check out is 10:00 AM. The maximum capacity is 6 guests. There is a $10 nightly charge if a 7th guest is accepted.